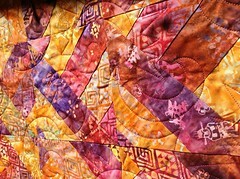 Welcome to my Creek Girl Quilting website! 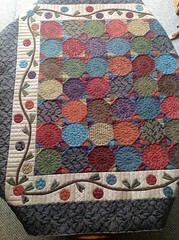 I will regularly post here a tip for quilting (QUILTING TIP OF THE DAY) or a general tip that you might find useful or fun (TRY THIS!) 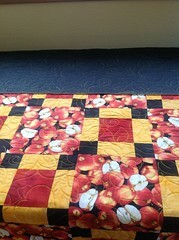 so keep checking back for more ideas to help make your quilting experience one that brings you satisfaction and pleasure. 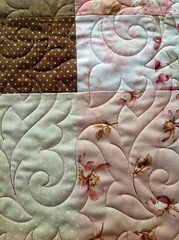 QUILTING TIP OF THE DAY: If your border doesn’t require mitering, don’t do it. It is extremely difficult to sew a mitered border correctly, which results in your border corners being oversized and not square. 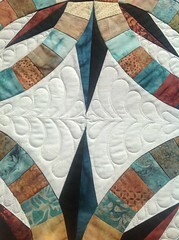 QUILTING TIP OF THE DAY: Always (always!) 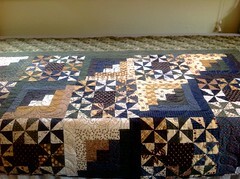 measure your quilt before cutting a border. Never attach an oversize border and cut off the excess, because your border will almost always be too large and have ripples or waves. 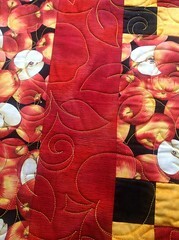 QUILTING TIP OF THE DAY: When cutting borders, try to use the lengthwise grain as much as possible to avoid rippling or waves in your border. 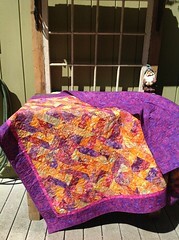 QUILTING TIP OF THE DAY: Be sure that your quilt top and your backing are square or rectangular (piece your top carefully and cut your backing accordingly), and your backing has at least 4 inches extra on each side if you plan to send it out to be quilted. 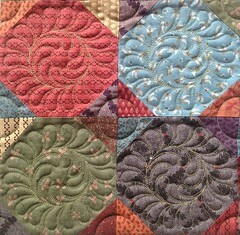 QUILTING TIP OF THE DAY: Trim all loose threads on the top and back of your quilt top and your backing prior to sending to your quilter to ensure that the machine foot doesn’t catch a loose thread and rip the quilt during the quilting process. TRY THIS! Make your own lavender water for ironing by combining 2 cups of distilled water, 2 ounces of cheap vodka and 15 to 20 drops of 100 percent essential oil of lavender (available at health-food stores) or another scent. OR TRY THIS! Make your own vodka water spray starch (like Mary Ellen’s Best Press). Combine 2 tablespoons of 90-proof vodka, 2 cups distilled water, 8-10 drops of scented oil like lavender, lemon, coconut, or rose scented oil (this is optional). The vodka helps get the wrinkles out of the fabric and gives the fabric a clean, crisp finish without leaving spray starch residue. 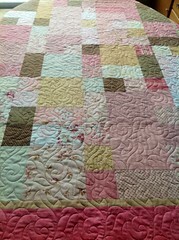 QUILTING TIP OF THE DAY: If you have a very detailed cutting and piecing pattern, it helps to cut all pieces for the blocks first, and then lay out the pieces to each block on heavy paper prior to stitching. Stack up papers containing all the pieces for each block, and then just sew one block at a time without looking for pieces. This way you will be sure you have all the pieces cut correctly and enough pieces for all your blocks, and you can just concentrate on making beautiful blocks.